“Because it’s the right thing to do,” I said. So, people started to help him and got the things he needed and wanted. He became everyone’s friend. He never got bullied another day of his middle school years. Ra’Shavdrick’s goal for college is to work hard to earn a scholarship, and to save money he earns from selling our books and eBooks. When you download The Bully Diaries, Ra’Shavdrick earns $3 and Stand For The Silent receives a donation. Your purchase also ensures that participants like him can continue to access Writing for the Soul Workshop™ at no cost to them. During checkout, enter Coupon Code: rashavdrick17 to save $1.00! Stand For The Silent exists as a platform that has allowed its Founders’ Kirk and his wife Laura to travel and speak to over a 1,000,000 kids in over 1,200 schools. 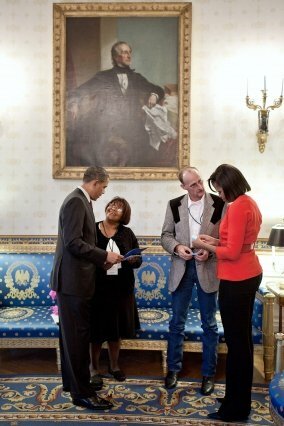 In the photo, Kirk is pictured here speaking with former First Lady Michelle Obama.